Chet Atkins, "Stars and Stripes Forever." 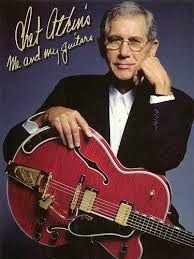 I was never a fan of Chet Atkins' "Countrypolitan" style of music, but the man sure could pick. Thanks to my wife for the link to the video below of him playing an appropriate tune for the Fourth. The link was through the University of North Carolina's superb Southern Folklife Collection.